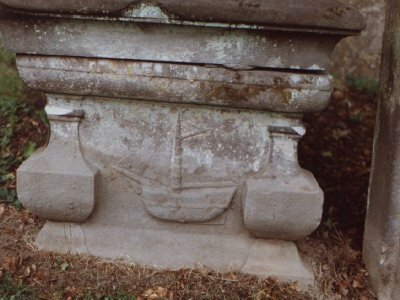 Here lyeth the corps of JOHN SCOTLAND, son to WILLIAM SCOTLAND, shipmaster in Kincardine and JANET DEWAR. He dyed the 20th August 1758 aged 20 years. "Tho' Boreas blasts and Neptune's waves"
"Have tosed me to and fro"
"Yet by the provedance of God"
"And here at anchor I shall ly"
"With all our glorious fleet"
"Before the time we get the call"
"Our Admerl Christ to meet".